On Wednesday 20th July, Larissa Allwork and Mike Noble were pleased to be invited to Grassmoor Primary School’s Year 6 performance of their Heritage Lottery Funded and Centre for Hidden Histories supported project the ‘Class of 2016 presents the Class of 1916’. Year 6 students at Grassmoor have worked with Paul and Gertie Whitfield from Whitworks Adventures in Theatre to research the history of Grassmoor School during World War One. 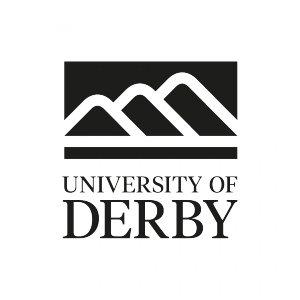 Prior to their Heritage Lottery Funded and Centre for Hidden Histories project, Gertie had previous experience of these types of initiative having acted as an Impact Fellow at Sheffield Hallam University on a World War One drama project with Professor Matthew Stibbe. Using documents from a visit to Grasssmoor school by Derbyshire Records Office, Grassmoor students were supported by Paul and Gertie to create short dramatic sketches and creative writing pieces in response to the history of their school and local community. These documents included unique and historically rich primary sources such as, Headteacher, Mr Charles Mason’s Elementary School Log Book from 1916. 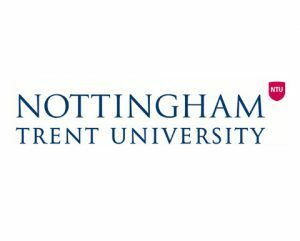 During the course of their project, the students have also benefited from a World War One activity day at the University of Nottingham and a trip to see a reconstructed World War I era classroom at Armley Mills. 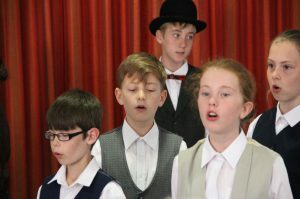 These activities culminated in a special end of year performance by year 6 students at the School, which featured historical information, creative responses and songs (please click the link for a Grassmoor Class of 1916 Programme). 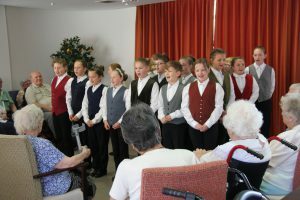 The following day, the students performed the ‘Class of 1916’ for residents at Smithybrook View, Clay Cross. 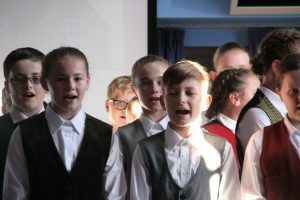 Please see below for photographs from the event and use the media player to listen back to Grassmoor students singing ‘It’s a Long Way to Tipperary’, Jack Judge and Harry Williams’s song which became very popular during World War One. 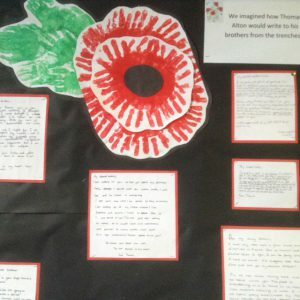 Grassmoor poppy and World War One creative writing display. Grassmoor School and Smithybrook residents. 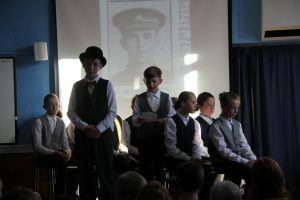 There is also audio of Grassmoor students discussing their use of historical primary sources such as censuses, which provided the basis for students imaginatively recreating letters written between the Alton family during the First World War. Be warned, there is some background noise on this extract which you can access from the media player below! However, this reflects the very positive fact that the School Hall was packed with almost fifty parents, relatives and community members, who had turned out to support this very special Grassmoor event. Headmaster at Grassmoor School, Mr Steven Fidler commented, “What an interesting way of bringing history to life which you have done over the last six weeks and the learning that you have got from this project…has been fantastic.” All families with children at Grassmoor School were entitled to receive a Grassmoor Class of 1916 book, an anthology of the main findings of the project and a memento for students and staff involved in its production. Click on the link to access a the contents of the Grassmoor Class of 1916 book. Year 6 students who participated in the ‘Class of 1916’ were surveyed following the performance. Out of a total of 21 responses, all students confirmed that they had enjoyed presenting their project, while 86% of respondents said that they would like to do more projects on World War One. When asked what they had learnt, students commented on key events such as the Battle of Jutland, the impact of conscription on the local history of the village as well as aspects of their own family history in relation to Grassmoor and World War One. Indeed, some of the students were directly related to the soldiers that they were studying. Other students expressed an understanding that Grassmoor was once a coal mining village and that there were significant differences between the experiences of school children in 1916 and 2016. I had the great pleasure of working with Gertie and Paul on this project as the Y6 class teacher, the children were amazing throughout the process making me a very proud teacher. 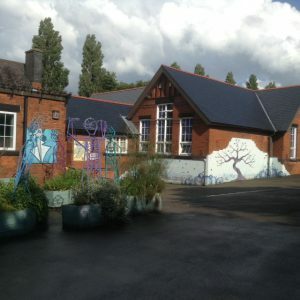 Not only did the children learn a tremendous amount about Grassmoor in 1916 – I did too!